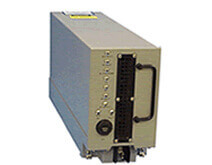 This ATR-size airborne Mini-DAMA Power Amplifier is designed for mounting tray applications. It provides 100 watts of RF output power under all conditions. It also includes a transmit/receive switch for full-duplex operation. And, its power supply operates from a 3 Phase, 400 Hz input. 5.25" W x 9" H x 19.5" D, 28 lbs.